InSight's twin solar arrays are each 7 feet (2.2 meters) wide; when they're open, the entire lander is about the size of a big 1960s convertible. Mars has weaker sunlight than Earth because it's much farther away from the Sun. But the lander doesn't need much to operate: The panels provide 600 to 700 watts on a clear day, enough to power a household blender and plenty to keep its instruments conducting science on the Red Planet. Even when dust covers the panels—what is likely to be a common occurrence on Mars—they should be able to provide at least 200 to 300 watts. 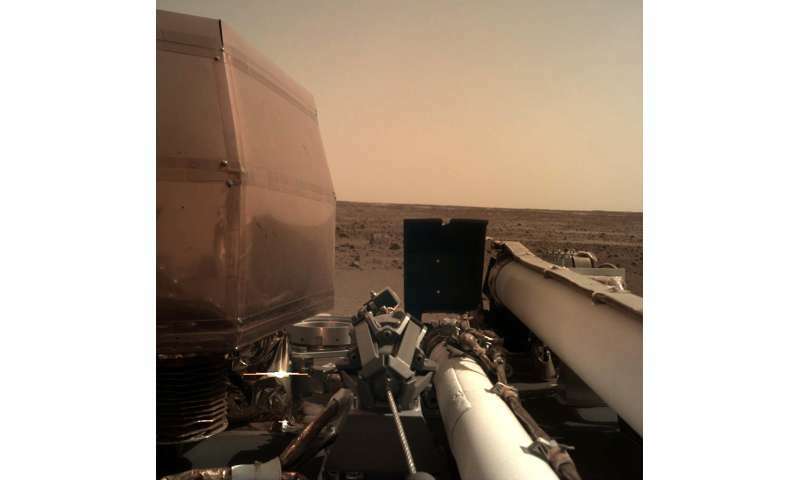 In the meantime, InSight will use its weather sensors and magnetometer to take readings from its landing site at Elysium Planitia—its new home on Mars. I'm just a bit curious, why they choose only three analysis instruments for InSight (seismometer, two thermometers, RISE X band rotation analyzer) along with two low resolution (1MP) cameras. I guess because its mostly stationary? What other instruments were you expecting? Not being a jerk BTW, just also curious to know so we could discuss more. granville583762 are you saying we should have sent a digital microscope? It sounds like at first you were and then you started saying how poor the quality of them are as if that wouldn't be what we should send? Also any microscope can be made digital by attaching a cmos/ccd sensor at the end of the tube. Focus and zoom can be done very easily by adding servos or ultrasonic motors or something similar. I give it a day until people start saying they've found some kind of alien artifact in the picture. It was a dedicated mission to gain insight [sic] into Mars, its core and its status (solid or liquid; seismic active or passive). Geology, not biology - that is the Mars 2020 rover responsibility and it, as well as the same time ExoMars, is dedicated to look for extant or extinct life for the first time (since habitability was established). Though notably, if the innards are active and heat transmitting the crust habitability goes up. The geology data couples back to understand Earth/exoplanets. Mainly the instruments were expensive, massive and complicated enough (two years delay due to one missing the deadline); the cameras is for positioning the instruments mostly; they also have a weather station, since it is cheap, light and vet the seismology and thermometer data.